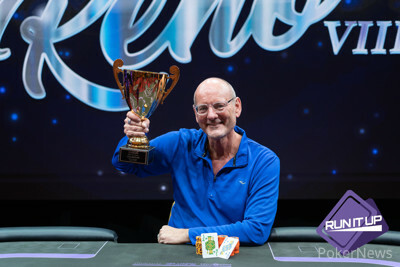 The Run It Up Reno VIII $235 Pro Bounty – which offered a $300 bounty on various pros – attracted 174 runners to the Peppermill Casino. After more than 12 hours of play, RIU fan favorite Jim Petzing, who the night before gave stand-up comedy a try at an open-mic night, came out on top to win the title and $7,930 first-place prize. While he didn’t collect any “pro” bounties, he did nab an extra $100 that was placed on Andy Pokrivnak by another player. He also had to contend with his friend David Larson in heads-up play. Interestingly, the two, who live in the same apartment complex in Las Vegas, had dinner earlier in the night and fantasized about the possibility of making the final two. One of the reasons it felt so great was that the win came after some close calls at the LAPC. It was there back in February that he made six final tables in two weeks, but never managed to close one out. 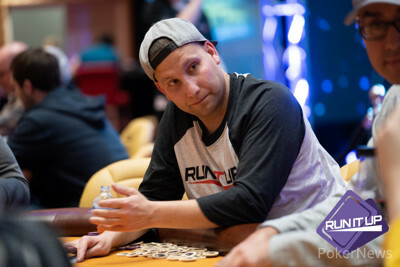 Among those to cash the tournament but fall short of the final table were Todd Studenicka (10th - $780), Scott Moskowitz (12th - $620), Patrick Tardif (15th - $500), Benjamin “Spraggy” Spragg (16th - $500), Kenyah Harris (19th - $400), and Andrew Romeo (21st - $400). 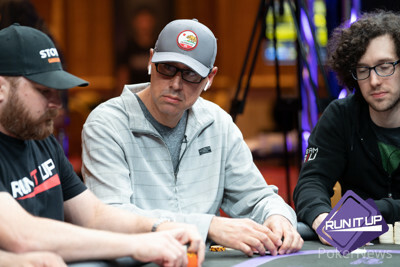 In the final hand of the tournament, David Larson moved all in for his last 560,000 and Jim Petzing quickly called. Petzing was way out in front and held after the board ran out . 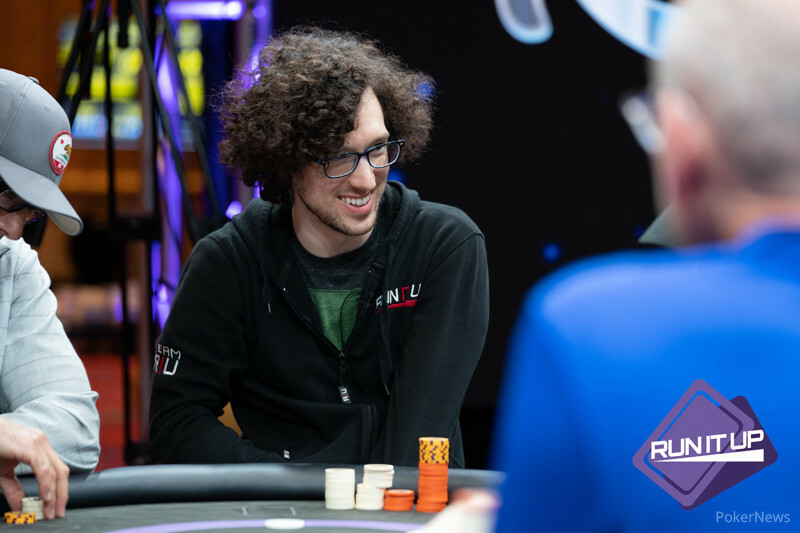 Jim Petzing raised to 300,000 from the button and then snap-called off when Miguel Cardenas three-bet all in for 1.1 million from the small blind. Cardenas had the worse ace but did flop a flush draw on the flop. The turn gave Petzing two pair, and the river saw him ship the double. Cardenas was left with 10,000 after the hand, and despite tripling in the next hand, he busted the one after that with ace-deuce to David Larson's pocket sevens. Stefan Helber moved all in for his last 95,000 from the small blind, and while he didn't seem excited about it, David Larson called out of the big blind. Helber was ahead and held on the flop. Unfortunately for him, the dealer burned and turned the to pair Larson. The river was no help to Helber and he hit the rail in fourth place. 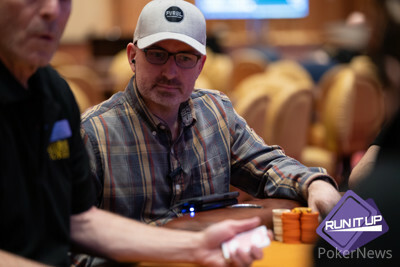 As the last player sporting Run It Up gear, Helber was the "last warrior standing," which means he will be entered into a special drawing later on during the RIU Reno VIII. David Larson moved all in for 625,000 from the button and Jordan Spurlin called off for 380,000 from the big blind. Spurlin was ahead and looked good through both the flop and turn. However, disaster struck when the spiked on the river to give Larson a winning straight.